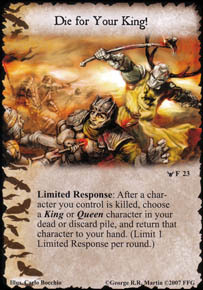 Card: Die for Your King! How does this work with Aloof and Apart.. Can they be returned to my hand if they cost over 4? Yes, AaA only prevents you from returning 4+ cost chars in play to hand. AaA does not interfer with out of play areas like the dead and discard piles. → Card: Die for Your King!